How To Wear Vintage Clothing Without Looking Like You Are Wearing A Costume? If you are following me on Instagram you could see that I started doing series of the Instagram story where I talk about different subjects every day, from fashion, lifestyle to beauty. I decided to document them on my blog so you can always have an access to it. The other reason is that I talk in Serbian there and I think that subject that I'm talking about are handy and useful so it's better to have them here forever! 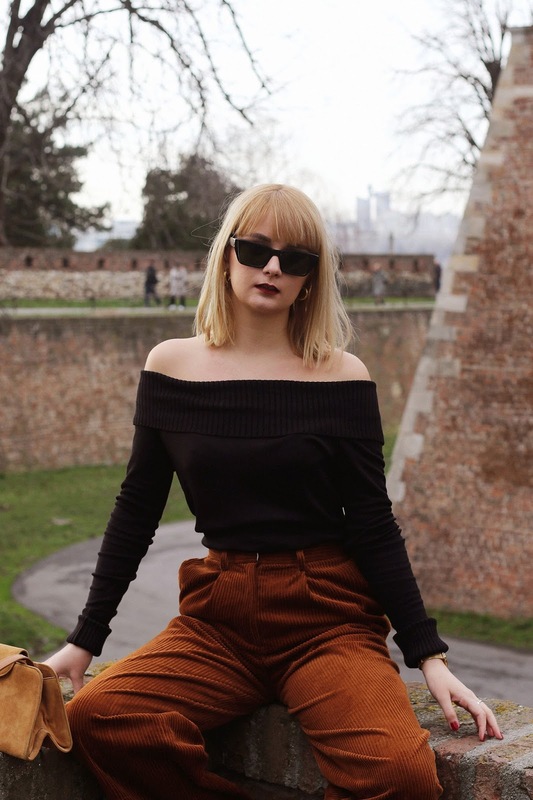 Today I'm going to talk about how to style vintage clothing without looking like you are wearing a costume and how you to wear clothes and not vice-versa. I love wearing vintage clothing! It's like you are wearing a piece of history and at the same time, you are writing a new one with your wearing. In order to look good in vintage clothing, you really need to like it! Pick a vintage clothing that you REALLY LIKE. Don't settle for anything less than that! I know that it's cheap but you shouldn't buy clothing just for the sake of its price. You don't want to end up having a bunch of boring clothes with whom you can't do anything, but you "had" to buy them because they were cheap. Buy clothes that you really like! I always that thrift shops are the best places to buy basics, such as good jeans, blouses, and turtlenecks as well with the statement pieces. If you have enough of basics (but let's be honest, you can't have enough of them :D ) go on a hunt for a statement pieces. It could be jacket, blazer, dress or a skirt. Make sure clothing you decide to buy FITS YOU. Here I only think of not being too small for you. People like buying clothes that are too tight for you, so please make sure you are buying something that actually fits you. It's okay if it's a bit bigger, you can tailor it on your own to be a bit tighter to fir you better, but don't buy clothes that are too tight or small for you. It's important that you FEEL GOOD in the clothes you buy. To style it with the basics! They are timeless and they always look good with everything, especially with the vintage clothing. It's not like in vintage clothing you can't find basic pieces, of course, you can but here I'm talking about statement pieces, like a blazer with padded shoulders. Experiment with clothes and styles, go out of your comfort zone you'll surprise yourself with how good you can be at styling! Remember there are no rules on how you should style vintage clothing, you can style them however you want. The only thing that's important is that YOU ARE WEARING your clothes not vice-versa. Don't wear something just for the sake of trend because it won't suit you and you'll end up looking fun and nobody wants that, right? Do you like wearing vintage clothing? Do you have any pieces of advice on how to style them? *This post is done in a collaboration with the agency Nakturnal. For more info click here. I like what you did with this outfit! I would have never guessed that the top is the vintage one and not the pants. The heels add personality to the entire look! You always look flawless! I love this outfit, never in a million years could I pull something off like this, I think if I tried vintage clothing my appearence would be more comical but you just look beautiful and elegant in everything! Fashion goooals. You made my day with this comment! Thank you so much!! Your outfit is great. I like your tips pointed out in the article. First of all, let's not buy the clothes because they are cheap. My mum does that, a lot. And then, it's so important to feel good in the clothes we try on! The pants looked very vintage indeed but the top looked in style. You look gorgeous in your vintage look outfit. I really like your pants and your entire outfit. You look classy and elegant. my favourite from your look was for sure those shoes! But yeah, I totally get what you are getting at here, I feel like the most important thing is to make sure the piece you are wearing really suits you, and not be afraid of adjusting it to fit you better! I actually really like the vintage look because it is unique and you won't have to worry about bumping into someone wearing the same exact outfit as you. Those pants are super cool. Yeah, I totally agree with you! You look absolutely stunning, love the outfit and the whole look. I agree with the points you have mentioned in this post, especially feeling good in what I am wearing is the top priority for me. Thank you so much! Yeah, that's the most important things, always. Some great tips to wear vintage clothing. I really need to work on getting creative with an outfit. I seem to always go for looks in my comfort zone. If you didn't say it was vintage, I wouldn't have thought they were. They look modern to me. I would consider my 'vintage' clothing from when I was in high school. Great tips. I love the way you coordinate the costume together, completely absorbed by your vintage outfit. First off I love your outfit, it looks amazing on you. Especially the top, I love it. I need to find one of those. Secondly I love all the tips you shared. I definitely think it’s good to feel good in any piece of clothing you buy. Thank you for sharing this. This is such a great way to style the pants! The off-shoulder top and the captoe pumps are so cute together.